For some photographers, a rainy day is a bit of a washout. 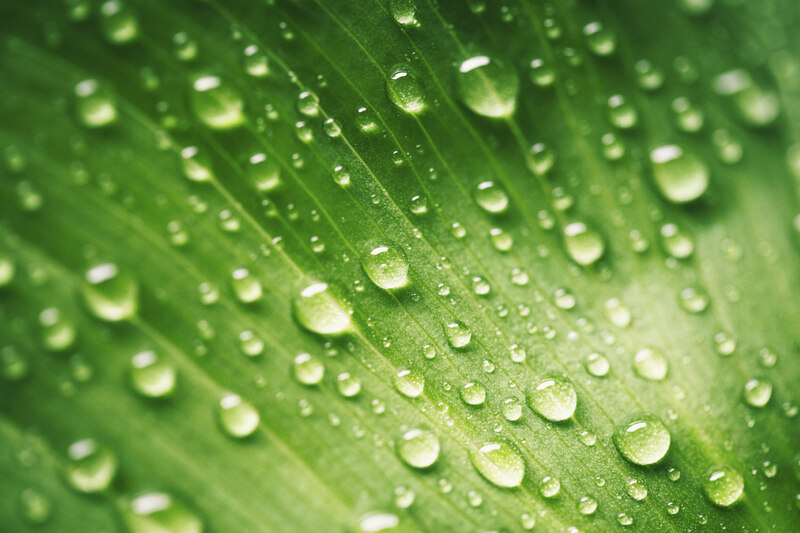 But for macro photographers, a little bit of moisture can go a long way in helping them create a texture-rich macro image of a plant covered in raindrops. It’s a subject that’s pretty easy to shoot, has lots of visual interest, and can help bring a close-up shot of a plant to life. In this quick guide, we explore the steps you need to take to get those perfect macro images of water droplets. 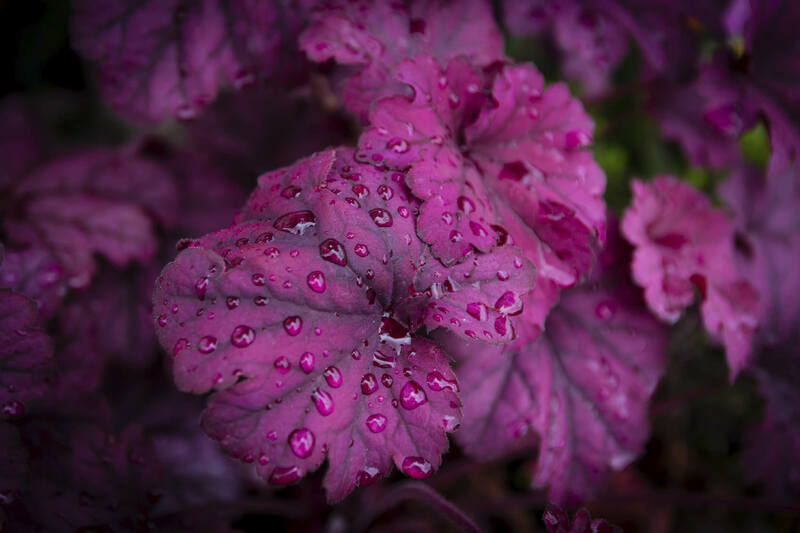 Although raindrops can be an attractive addition to many subjects, they really add a special something to flowers and foliage. The trick here is to find a plant that has certain characteristics that will be enhanced by the presence of the water droplets. Look for something that has relatively punchy colors and other interesting details to give your image a bit of pop. A plant that is in partial sunlight will work the best as the diffused light will be much more pleasing in your image. But, if you fancy a plant that’s in direct sunlight, simply use a diffuser to soften the light. Since you’re shooting a subject that’s relatively motionless you can set up your camera on a tripod to ensure the sharpest result. A macro lens with a 1:1 reproduction ratio would be preferable, but you can also use a regular lens with extension tubes to get up close. A remote shutter release would be a handy addition as well, just as another way to prevent camera shake. Regarding camera settings, use aperture priority mode so you can determine the depth of field. An aperture of f/11 is a good place to start as that will give you a deep enough area of focus such that most of the plant and water droplets are nice and sharp while having a background that’s nice and blurry as well. Dial in a low ISO to minimize noise - 100 would be preferable, but if it’s windy, you might need to increase the ISO so your camera can select an appropriately fast shutter speed to freeze any movement. If it hasn’t rained recently or if your selected plant hasn’t been hit by the sprinklers yet, use a fine mist spray bottle to add your own water droplets. Using a fine mist and doing so with some restraint is key for the shot. If you overdo the water, it will begin to pool and run off the plant. Even worse, if you weigh the plant down with water, it may begin to droop, which won’t be a very attractive image. Just give the plant a few short bursts of water, ensuring all parts of the plant that will be in the image are getting the water you need for the shot. When shooting macro, the chances are that your camera’s autofocus system will struggle to get the focal point right, even if you have a very high-end camera. To get around this issue, set your lens to manual focus and engage live view on the LCD. 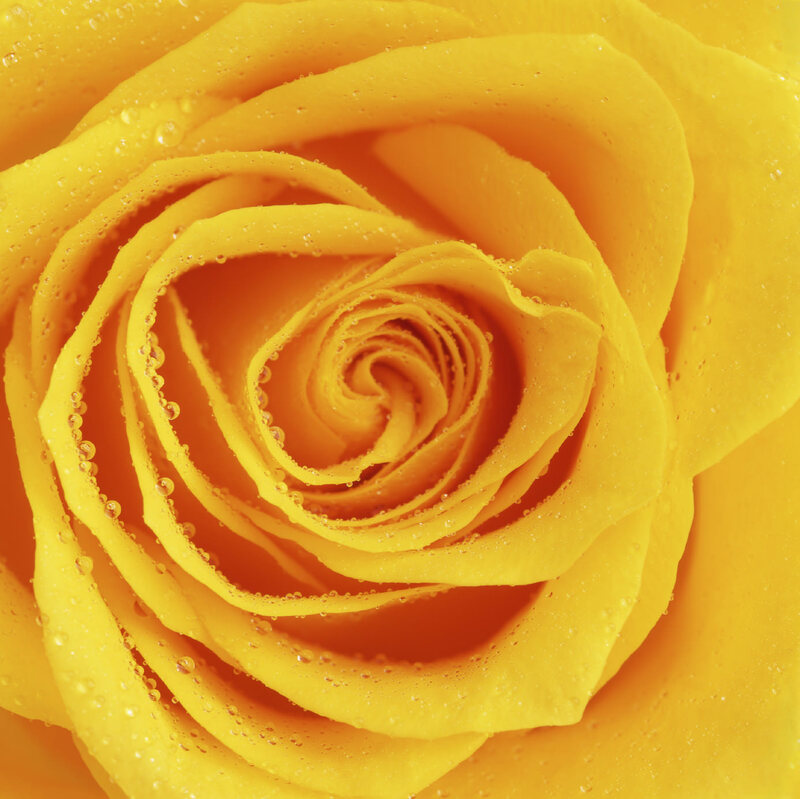 Using the LCD, zoom in on your focal point and adjust the focus of the lens. Once you’ve established that your focal point is indeed tack sharp, zoom the live view back out so you can see the full view of the frame, checking to ensure your framing is spot on. Once you’ve done that, fire the shutter! 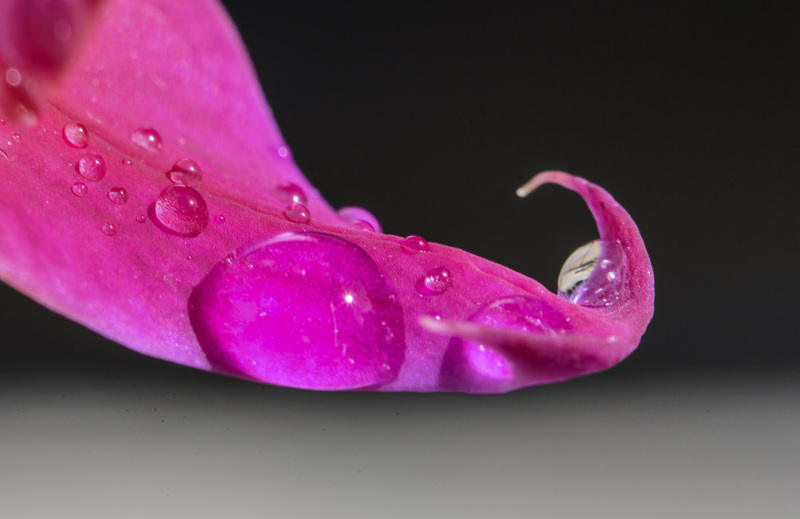 The real trick to perfecting your raindrop image will be making any necessary adjustments to your setup to get the best image you possibly can. Common problems might be overexposure or underexposure, blurriness, and poor framing. Fortunately, each of these issues can be easily addressed by making simple adjustments. If the exposure is off, try a different aperture to account for more or less light, noting that a change in aperture will impact your depth of field. If the issue is blurriness, try a higher ISO to give the camera some leeway with the shutter speed to account for any wind. 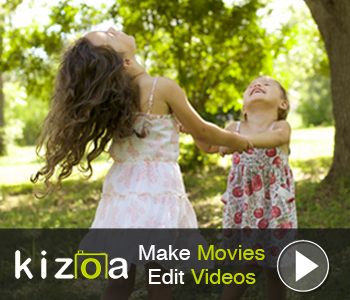 If you find that your framing is off, simply recompose the shot using live view and try again. Just remember that since macro images deal with such tight depths of field, any adjustments you make to the camera’s positioning, its settings, or the tripod will necessitate repeating many of the steps above to ensure everything is framed up and in focus as it should be. The possibilities with water droplets and plants are virtually endless. Frame up a wider shot that incorporates the entire plant. Frame the shot tightly on one part of the plant for a more abstract and otherworldly composition. 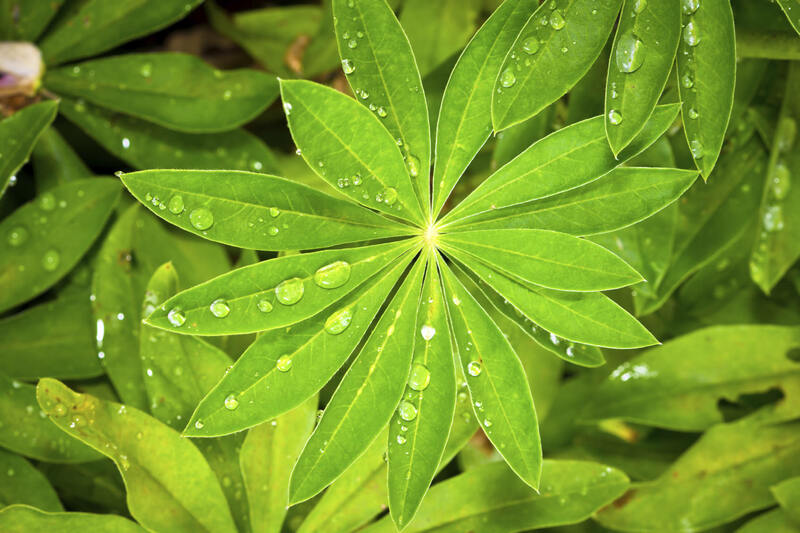 Try for a rain or mist effect by firing the shutter as you spray the plant with water. 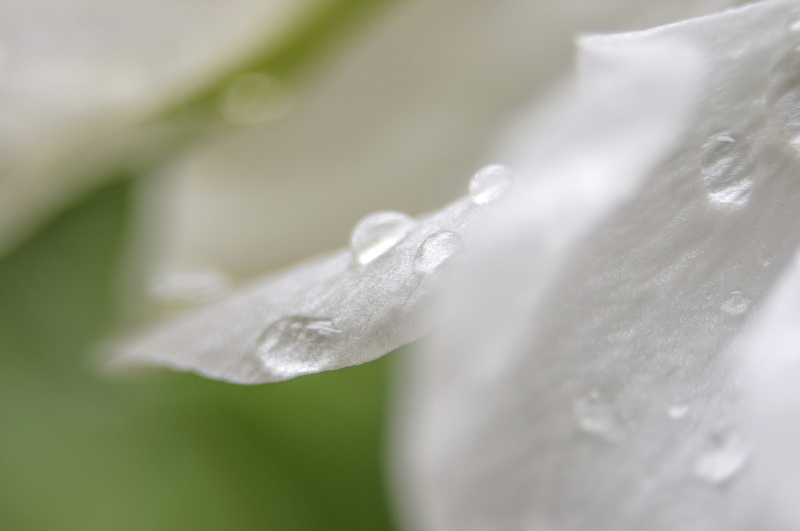 The point is that how you approach macro photography of water droplets is really only constrained by your imagination. 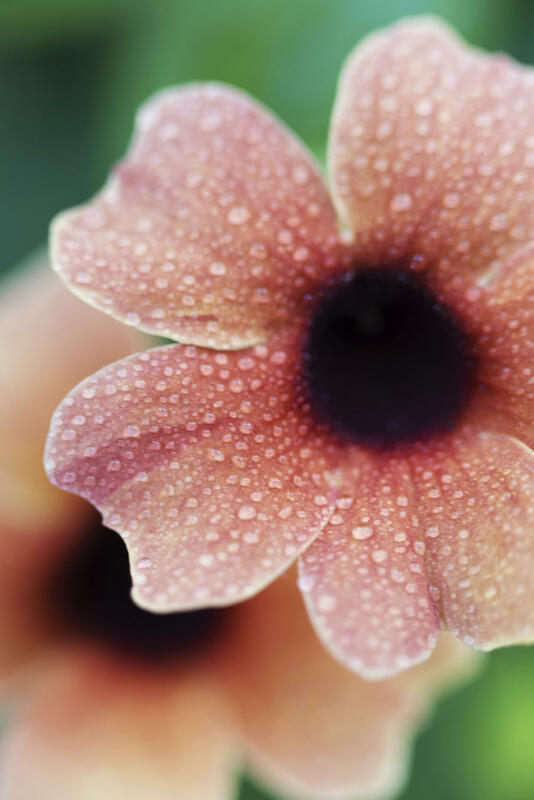 Experiment with different shooting angles and lighting, different plants, and varying levels of water to see how they impact the images you create. Above all, just have fun!